Reply To: LO206 getting better or same engine as always? Home › Forums › Briggs & Stratton 4-Cycle Racing › Briggs LO206 › LO206 getting better or same engine as always? › Reply To: LO206 getting better or same engine as always? One correction to Aaron’s post – it’s not a certified engine builder who builds and seals the LO206 – it’s the Briggs factory that does it, and does it only once before the engine goes out the door. There’s no “re-sealing”. Reality #1 – as EXCELLENT a job as Briggs does in providing a level playing field, with GREAT rules, and tight manufacturing tolerances and specifications for every LO206 that goes out the door, there is always some possibility (however small) that some engines will be ever so slightly better or worse performers than others. If you can acknowledge that fact, there is at least in theory, the possibility that there are some engines today that are faster than some engines built 5 years ago. Reality #2 – even if you acknowledge Reality #1, unless you are paranoid or into conspiracies, there is no empirical evidence to suggest that any production batch has resulted in a better or worse engine than any other production batch, going back to the first engine produced. The only people I hear suggest otherwise are those who are not winning – and while I hate to judge, I’d say they’re making excuses. The guys who are winning have proven over and over with consistency that any (properly maintained) engine you stick on is capable of winning. 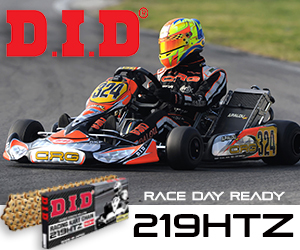 The LO206 is the best engine program ever introduced for kart racing.